The DTC is designed to monitor the ignition timing at cold start. When the engine is started at an engine coolant temperature of below 50°C (122°F), the ECM checks the ignition timing during engine idling. If the ignition timing advances beyond the specified level within 10 seconds, the ECM interprets this as a malfunction. The MIL is illuminated and a DTC is stored when the malfunction is detected in consecutive driving cycles (2 trip detection logic). Insufficient ignition timing retard at cold start (2 trip detection logic). 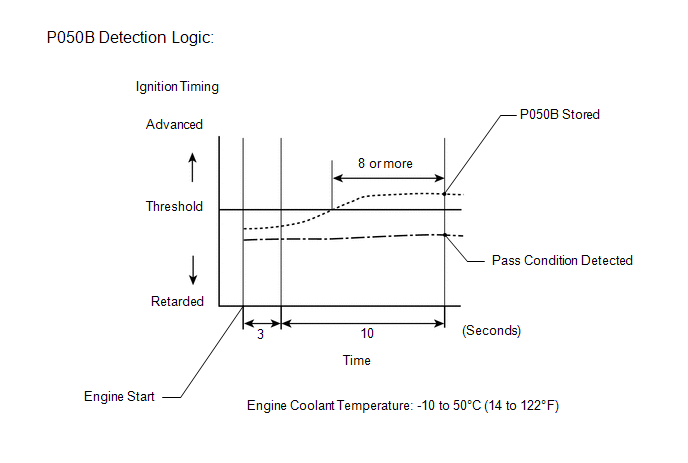 DTC P050B may be output when the engine has the symptoms listed below. If necessary, check the trouble areas listed below. If any DTCs other than P050B are output, troubleshoot those DTCs first. (e) Read the values displayed on the Techstream at engine idle. (f) Add together the Short FT #1 and Long FT #1 values to obtain the total fuel trim. Total of Short FT #1 and Long FT #1 values is between -20% and 20%. (a) Check for deposits around the throttle valve and throttle valve condition. (l) Input the DTC: P050B.